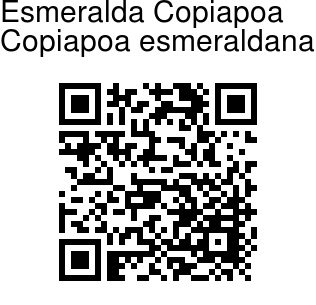 Esmeralda Copiapoa is a low-growing cactus, native to the Esmeralda region of Chile. Stem is green, soft, succulent, 3-7 cm, tip covered with white wool, particularly at flowering time. Ribs are 13-16, deeply toothed, tuberculate , 6-10 mm tall. Tubercles are rounded, chin-shaped. Areoles are 3-4 mm in diameter, apical, slightly dislocated in the lower part of the tubercle, 8-15 mm apart, covered with short whitish wool when young, later hairless. Spines are brownish to ash-grey, straight. Young plants only have thin radial spines, while the centrals appear as the plants mature. 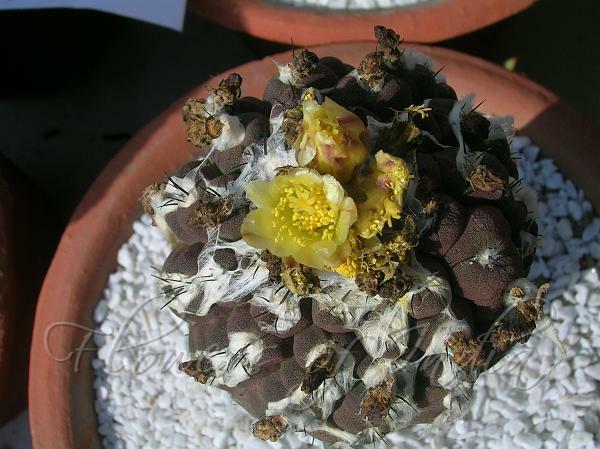 Flowers are yellow, bell-shaped, scented, about 3.2 cm long. They grow from the center of the white wool at the tip.